Smart technology has long been a staple of of high-end houses. Affluent individuals, by virtue of luxury home amenities, have always been early adopters of the latest domestic devices and services, creating an “Internet of Things” long before we had a name for it. But as the Internet of Things has become more egalitarian, and the market more viable, the development of connected technology has reached a torrid pace. New intelligent in-home products, from the invaluable to the outlandish, are reaching consumers on a near daily basis. Amid all the noise, we have identified the trends which will define the smart home space for luxury buyers over the coming year. Expect 2017 to continue the trend that closed 2016: Everyone wants to be your smart home hub solution. The heavy hitters—Amazon, Google and Apple, are already in this space, but they are getting lots of company. Amazon offers the Echo and Echo Dot, voice-activated speakers of varying size that employ the company’s Alexa technology to answer your questions, engage your digital media libraries and control your smart home products. Google’s recently released Home is a similarly capable speaker solution, but the brand’s rich history in search may serve to separate the device, which is linked to Google’s expansive information database, in an increasingly crowded hub space. Or that’s Google’s hope, at least. Apple, as is their wont, is taking a different tack, albeit not in terms of naming conventions. The release of iOS 10 saw the introduction of the Home app, a program to manage the many smart home accessories in your house. No physical hub necessary. It was in your pocket all along. 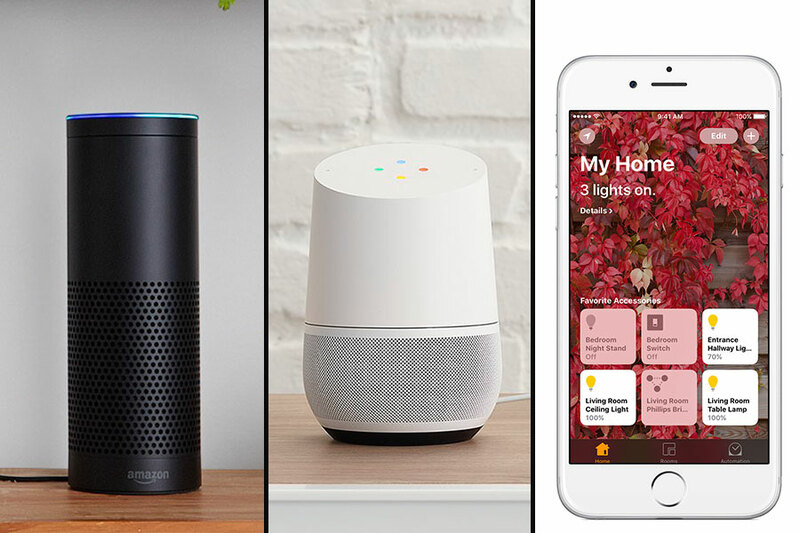 Among the big three, Amazon’s Echo has been the best reviewed, but in fairness to Apple and Google, their respective Homes are much newer to the market. There are several lesser-known contenders, like Wink and SmartThings, that hope their wide range of product compatibility—the smart home devices which they can communicate with and control—will win them converts. Alternatively, users could buy out-of-the-box all-in-one solutions like Vivint or build their own network of Nest products, but that track would require an almost certainly unattainable level of brand loyalty. The proliferation of connected devices means the hubbub over hubs will likely be front-and-center for the extended future. Who ends up on top? A lot will have to do with product compatibility and user experience. But the more intriguing development to track will be whether users prefer a physical in-home device like Echo or a phone-based app for managing their smart home. And here, Apple may have the edge. Time and again, users have shown that they prefer what’s in their pocket. Think of all the products you used to carry that are now housed in your phone—camera, calendar, CD player. Instead of sprinkling technological totems throughout their home, it seems much more likely that users would prefer to talk to the device that is always within arms reach, when lowering lights or locking doors. Of course, that does mean the next time you leave your phone in a cab you may not be able to get in your home. As the explosion of interconnected devices continues unabated, smart home security, a.k.a. protecting your personal Internet of Things, will become of greater importance. Wherever there is opportunity, you can expect to find some unsavory actors, and if there is any chance your coffee maker knows your credit card number, you can expect someone will be trying to talk to it. More likely, they’ll flip your smart lock from their phone and sneak off with your silverware. How do you keep your network limited to you and yours? Vigilance, strong passwords and frequent software updates, experts say. But humans are famously fallible creatures, which is why Cujo exists. Cujo provides commercial-level systems protection (firewalls, product monitoring, data analysis) without the commercial-level expertise required to implement such protection, which has always made such security inscrutable for the common consumer. As smart home-related criminality becomes more commonplace, expect to see more products like Cujo enter the market, with even some of the big brands getting in the security game. What does 2017 hold in terms of new smart home tech? The ever-growing market means we’re likely to see everything from the everyday applicable to the absurd. A Wi-Fi-enabled couch with remote controlled seat warmers? Probably coming soon. One interesting development, in its novelty if nothing else, is the possible rise of gesture-controlled devices. Voice-activation has been de rigueur among the recent crop of smart home products, but companies like Fibaro and Bixi are betting that gesturing may be an even more intuitive action for users. Imagine, for example, changing the channel on your TV by swiping instead of speaking, and when you think about how often you text versus speak on the phone, the gesture crowd may be onto something. We should get our first good look at what is on the horizon early in the year at the Consumer Electronics Show, which runs from Jan. 5-8 in Las Vegas. But one thing is certain: You need a new TV. Yes, with a regularity rivaling presidential elections, it is time once again to upgrade your screen. 4K technology has arrived. Offering four times the resolution of the standard high-def TV, the 4K format is being adopted by more and more content providers. Google recently announced a growing catalog of Ultra HD movies and TV shows to its Play store, and as 4K is an increasingly standard feature of smart TVs, you’ll be able to download this high quality (looking, at least) programming directly to your device. Or you could hold out for a few more years and get a 16K HD Smart TV, with a resolution so crisp you’ll be able to peer into the very soul of your local newscaster.